Something you should keep in mind is that of the treatment that you give to the wounds that your dog presents will depend a quick recovery or, on the contrary, that they become infected and bring some harmful consequences for it. Clean the area where the wound has presented. Remember that,When you go to clean a wound, it is better to muzzle your dog. This preventive measure has little to do with trust: when a dog is scared or injured its natural reaction will be growling, and even biting. Before starting to heal the wound you should assess the severity of it. If your dog laments a lot, you see considerable inflammation, you can see parts such as tendons, muscles or bones, parts of skin or tissue hang, bleeding profusely or the cut is very deep, It is best to take it to the veterinarian to determine the process you should follow. Scratches or cuts can be easily treated at home, and it is better to do so to avoid future problems. Bleeding wounds require it to stop before cleaning. For it you must apply pressure on the wound for a few minutes (Remember not to do this too hard to not hurt your pet anymore). You can use gauze to absorb the remaining blood around the wound. 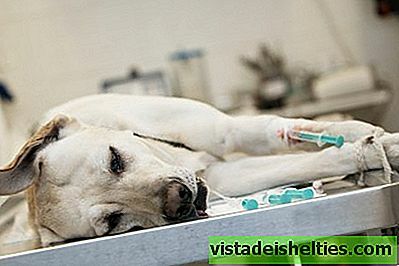 To properly clean a dog's wound It is advisable to trim the hair around the wound, since this can hinder the process. We suggest you use a small scissors and be very careful. Doing this will not only allow you to better evaluate the wound, but also will facilitate your healing. Clean the wound with soap and water, preferably using warm water. Procure remove any type of dirt (dust, dirt, hair), because this will prevent some kind of bacteria from entering your pet's body. 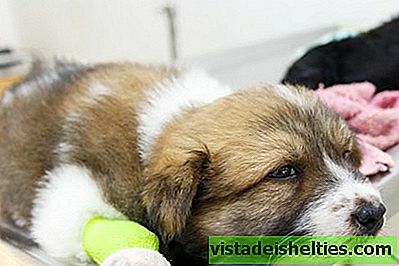 The warm water will also help the dog to remain calm, which will be extremely useful during the rest of the healing. This wash should be continued for at least 2 minutes. In case you notice that the wound is causing pain to the dog but it is not serious, or if it is inflamed you can put a little ice. Remember that you must wrap the ice in a cloth to avoid burns or that it sticks to the skin of the animal. Once you have controlled the inflammation, uses an iodine antiseptic to disinfect. Remember that before using it you should reduce the solution by mixing the same amount of iodine antiseptic with clean water. Then,using a gauze, make a careful contact avoiding leaving lumps on the skin of the dog. You must repeat this process at least three times a day. If you want to apply another class of products you can look for healing ointments or disinfectants, although always you better consult your veterinarian before applying a new product to your dog. For the successful recovery of a wound it is good to let it dry properly, therefore it is better that you leave it exposed. Of course, you must be careful and constant with cleanings, because when leaving the wound to the air we run the risk of getting dirty and getting infected. Unfortunately who tends to hurt more wounds is the dog itself, therefore it is important that you take care that you are not rummaging through the wound. An excellent way is put an Elizabethan collar, because this will prevent him from accessing the wound, in this way he will not moisten it and will be able to heal normally. It is very likely that your dog will resist using the collar, however it will be better for him in the long term, so that do not feel bad if you see it distressed while using it, as it is for your own benefit. Featured image courtesy of Soggydan Benenovitch. Why not leave your dog in the car?